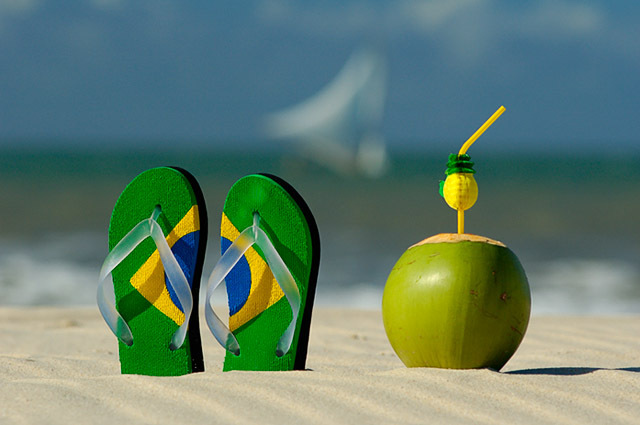 For the summer holidays, One Spoonful at a Time will be broadcasting from…Brasil! Brasil has captivated explorers and then travelers for at least 500 years. Stretching more than 7000 with a front towards the deep Atlantic, it hosts tropical islands, enchanting colonial towns as well as a natural beauty from its environment. It’s hard to generalize Brazilian food as you will see from pictures because there is no single national cuisine, rather distinct regional ones. There is a diversity of fruit, vegetables and spices, as you can see for yourself walking through any food market. There are four main regional cuisines: Comida mineira from Minas Gerais, based on pork, vegetables (especially couve, a relative of spinach) and tutu, a kind of refried bean cooked with manioc flour and used as a thick sauce. Comida baiana from the Salvador coast, the most exotic to gringo palates, using superb fresh fish and shellfish, hot peppers, palm oil, coconut milk and fresh coriander. Comida do sertão from the interior of the Northeast, which relies on rehydrated dried or salted meat and the fruit, beans and tubers of the region. Comida gaúcha from Rio Grande do Sul, the most carnivorous diet in the world, revolving around every imaginable kind of meat grilled over charcoal. Comida do sertão is rarely served outside its homeland, but you’ll find restaurants serving the others throughout Brazil, although – naturally – they’re at their best in their region of origin. Alongside the regional restaurants, there is a standard fare available everywhere that can soon get dull unless you cast around: steak ( bife ) or chicken ( frango ), served with arroz e feijão, rice and beans, and often with salad, fries and farinha, dried manioc (cassava) flour that you sprinkle over everything. Farofa is toasted farinha, and usually comes with onions and bits of bacon mixed in. In cheaper restaurants all this would come on a single large plate: look for the wordsprato feito, prato comercial or refeição completa if you want to fill up without spending too much. Feijoada is the closest Brazil comes to a national dish: a stew of pork, sausage and smoked meat cooked with black beans and garlic, garnished with slices of orange. Eating it is a national ritual at weekends, when restaurants serve feijoada all day. Some of the fruit is familiar – manga, mango, maracujá, passion fruit, limão, lime – but most of it has only Brazilian names: jaboticaba, fruta do conde, sapoti and jaca. The most exotic fruits are Amazonian: bacuri, açaí and the extraordinary cupuaçu, the most delicious of all. These all serve as the basis for juices and ice cream, sorvete, which can be excellent. All these foods will be explored, featured and described. 8 states in 1 month in a half, I will be updating my visits to market, culinary experiences, and unusual produce I encounter from each state. Keep up with the blog. Will be updating as much as I can and sharing with you my experiences. You’re going to have a ridiculous time. Make sure every meal is paired up with good local beer and a few caipirinhas, of course.